In a previous how-to, I showed how to send and receive text messages by wirelessly syncing them from your phone to your Nexus 7 tablet. Some eagle-eyed users may have notice that the Nexus 7 with 3G actually has a SIM card slot. Now, syncing messages over to your tablet may be convenient, but how about sending text messages using your Nexus 7 3G with its own number attached? You can! 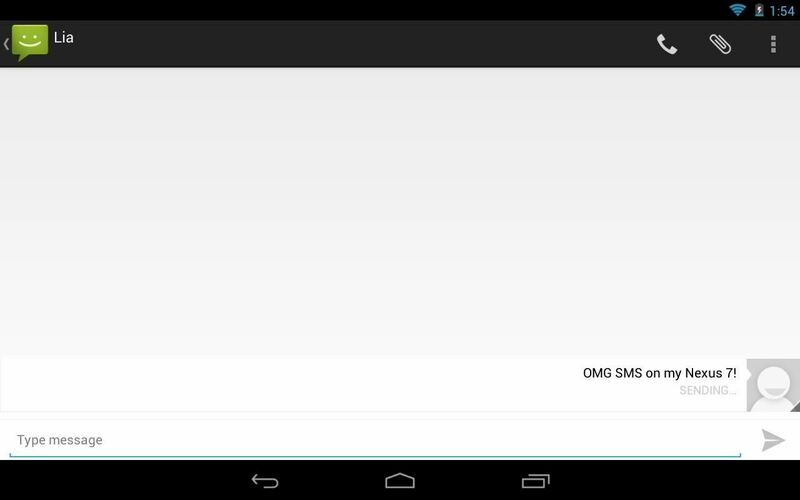 In this guide, I'll show you how to send and receive text messages on your Nexus 7 3G as it were a cell phone. Let's begin! Eject your SIM card slot on your Nexus 7 3G and insert your own SIM card with an active number in. If your Nexus 7 3G is running stock and unmodded, open up the Play Store on your tablet and download GO SMS Pro (free). That's pretty much it. 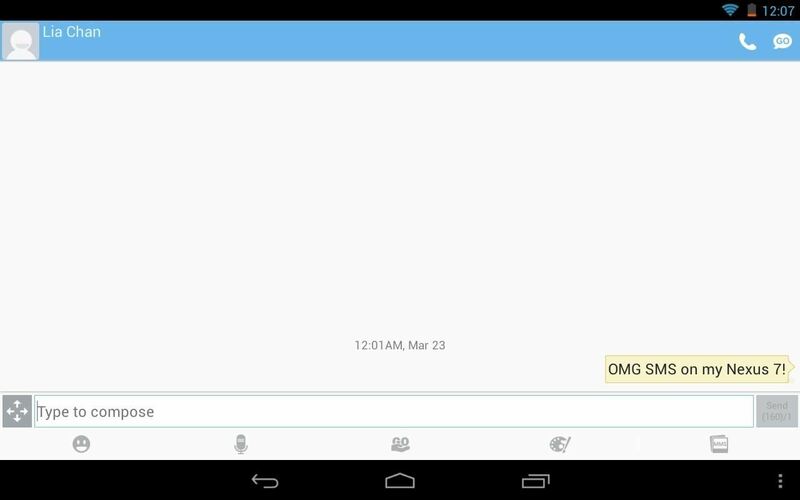 Launch GO SMS Pro and begin sending and receiving text messages from your Nexus 7 3G! The rooted method maybe be unfamiliar to some users, so before you proceed, head over to my definitive guide to modding a Nexus 7 to catch up on some terms and for instructions on getting your own tablet ready for this method. Now, first off—the method for stock users also works with rooted tablets, but I'll show you how to get the actual Jelly Bean SMS app on your tablet. Begin by heading over to this link on your tablet. Ignoring the ads on the page, locate the download button to download the ZIP file needed. Boot into your custom recovery, either with ROM Manager or using the "Reboot into Recovery" option when you hold down the power button. Here I am using TWRP on my tablet. Flash the ZIP file and reboot the tablet. And...success!!! Here you can see both apps installed. See, that wasn't too hard. Give it a shot and tell us it worked for you! Easier way for Verizon customers. Install verizon messages on your Nexus 7. You will then be able to send and receive texts on your nexus 7 using your Verizon phone number. If you have a WiFi only Nexus the Google voice app allows you to text off your Google voice number. It also has a nice widget for received texts and it is currently free. Excellent. !! I've been paying for a 3g contract for months and can now eventually use the Nexus to text.. Great stuff.! Very helpful tips! Thank you. Now that you have extract Jelly Bean native SMS app, I notice your screen also showed "Dialer" app icon, how do you extract Jelly Bean native Dialer? This is one of the feature I need to completely migrate from Nexux S mobile phone to my Nexus 7 3G tablet. My Telecom provider offers unlimited 3G voice/text/ and fair used data. I need to use cellular voice phone instead of VOIP using Google Voice. The dialer is non-working. It's just there for show. You can't make calls on the Nexus 7 3G even with it installed. Would you know if xda-developer forum are talking about getting Nexus 7 into Phone-Tablet device? I followed your step-by-step instruction, it works as indicated. However, I found that the ZIP file failed on verification and MD5. I have to un-checked the box there for installation to be successful. Great Tip! Really appreciate your contribution. I install go SMS pro and typed my number to activate my account. A error message came like "your phone cannot get verification code now, try it latter" . since I have given correct number which is in nexus 7 , I am facing this issue. Can anyone help me to solve this.